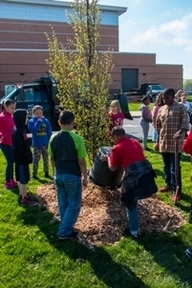 Communities, schools and other groups looking to boost green spaces are encouraged to apply for 2018-19 Urban and Community Forestry grants. Up to $100,000 is available for projects statewide through the DNR-administered program. “The focus of this year’s grant program is to support projects that help local communities better manage their urban and community forestry resources,” said Kevin Sayers, Urban and Community Forestry program coordinator. Depending on the project type, applicants may request grants up to $20,000. All grants require a one-to-one match of funds; these can be cash contributions or in-kind services but cannot include federal funds. Urban forest management, planning and innovation projects. Urban forestry and arborist training and education events and materials. Arbor Day celebrations and materials. "In urban landscapes, trees provide welcome shade, can help cool streets and provide habitat for wildlife," Sayers said. "They also can help homeowners increase property values and save on energy costs." Grant applications must be postmarked by Sept. 21, 2018, and projects that receive funding must be completed by Sept. 1, 2019. The grants are funded through the U.S. Forest Service’s State and Private Forestry Program. For a grant application or more information, visit michigan.gov/ucf, contact Kevin Sayers at 517-284-5898 or write to DNR Forest Resources Division, P.O. Box 30452, Lansing, MI 48909-7952. Chronic wasting disease and state parks centennial anniversary plans are among the agenda items at the upcoming meeting of the Michigan Natural Resources Commission, set for Thursday, Aug. 9, at the Lansing Community College Downtown Campus, Health & Human Services Dept., 515 North Washington Square in Lansing. 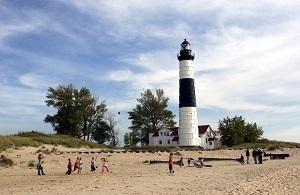 The Michigan State Parks Advisory Committee starts at 9 a.m., with updates on the Watkins Lake State Park and County Preserve general management plan, a Land Use Order to expand Highland Recreation Area's field trial area, Recreation Passport revenue and the state park system's centennial. The Committee on Wildlife and Fisheries follows at 12:30 p.m., with a discussion on upcoming fisheries regulation changes, an order defining the boundary of Highland Recreation Area field trial lands, and an update on an order for the removal of the temporary closure on DNR-managed land at the Otsego Dam structure. The Committee of the Whole starts at 1:30 p.m. DNR Director Keith Creagh’s report will include an update on chronic wasting disease and recognition of Chronic Wasting Disease Working Group members. Following public comments, the commission is expected to vote on CWD regulations and expansion of hunting opportunities at two properties, and Director Creagh is expected to take action on a land use order and several land transactions. Those interested in registering for public comment should contact Cheryl Nelson, executive assistant to the commission, at 517-284-6237. The full draft meeting agenda and other commission information are available on the NRC website michigan.gov/nrc. In case you missed it, the DNR's Conservation Officer Recruit School #9 got under way last month in Lansing. Twenty-two men and eight women have begun the 23-week academy, where they'll face a challenging series of physical, academic and natural resources training activities in their quest to join the ranks of Michigan's COs. Follow along by signing up for weekly installments of the department's academy blog. Candidates who successfully complete the academy then will be paired with veteran DNR conservation officers for an additional 18 weeks of field training. Learn more at michigan.gov/conservationofficers. Note to editors: For high-res versions of the images used above, or for other photo requests, contact Sarah Lapshan at 517-284-6054. Want to hit the trails before summer slips by? Free ORV Weekend is coming up Aug. 18-19, a great opportunity for Michigan residents and out-of-state visitors to ride DNR-designated routes and trails! Interested in expanding your hunting experiences to include quail, squirrel, rabbit or other small game? Learn more about small game hunting seasons, species and license requirements. We want to hear your ideas about recreational boating access along the Detroit River and East Grand Traverse Bay, as well as forest planning. Check out these and other opportunities for your input.